Some 3,000 villagers have attended an elaborate Hindu wedding ceremony in eastern India for two monkeys. The "bride" was dressed in a five-metre long sari and decked in flowers. 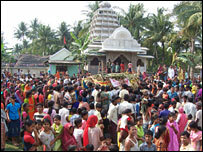 The ceremony took place last Thursday in Ghanteswara village in Orissa state. The guests were served a feast of rice, lentils, vegetables, fish and sweets. Monkeys are revered idols in Hindu mythology. But the couples that took in and "married" off the two monkeys in Orissa say they love them as pets. The monkey marriage took place some 200km (125 miles) from the Orissa state capital, Bhubaneswar. The "groom", a three-year-old male monkey named Manu, was taken by procession to a temple in the company of hundreds of bemused onlookers, accompanied by loud music, dancing and fireworks. Women welcomed the groom with loud, synchronised ululations typical in a Hindu marriage while priests chanted sacred hymns. "It was a unique experience for me. It was the first time I conducted a marriage between two animals. But I followed all the rituals that I do in human marriages," said Daitari Dash, the priest. Women prepared the female monkey, named Jhumuri, as they would a human bride, draping her in a red sari and smearing her with sandalwood paste. The monkeys were showered with gifts by those present. They included a gold necklace for the bride, donated by a local businessman. "I feel as if my own daughter is getting married. I cannot bear the thought that she would not be with us anymore," Mamina, the woman who has been looking after the female monkey said. Mamina has been looking after Jhumuri since her husband found her at a local temple. The male monkey, Manu, was found in a mango orchard in a neighbouring village by a couple who raised it as their pet. The two monkeys, who were kept in chains before the marriage, have now been released by their owners. They have been spotted hanging out at the temple where the "marriage" took place. A local villager, Mitrabhanu Dutta, said the event was a "nice way to release the monkeys from captivity".